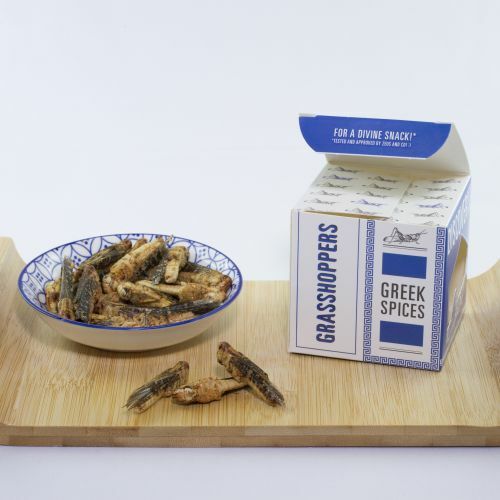 Whole dehydrated grasshopers, seasoned with Pepper & Dried Tomatoes, Paprika, Greek Spices and Fruity Curry flavour. 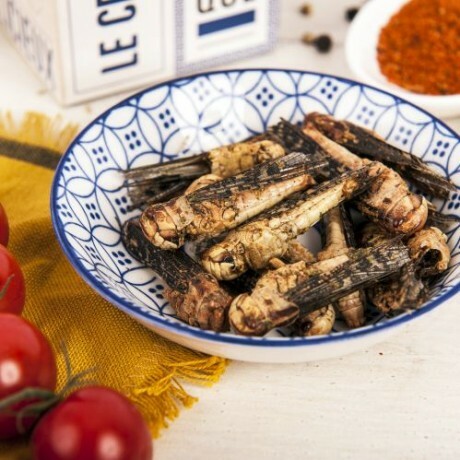 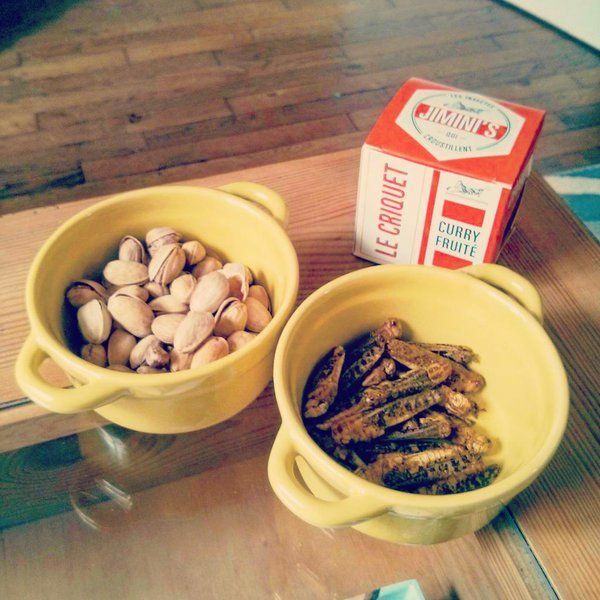 Delicious and healthy snacks with seasoned and dehydrated insects. 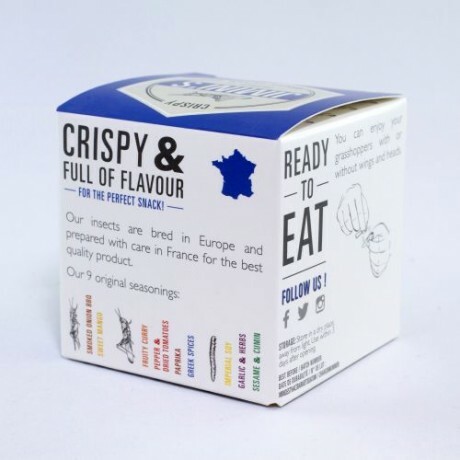 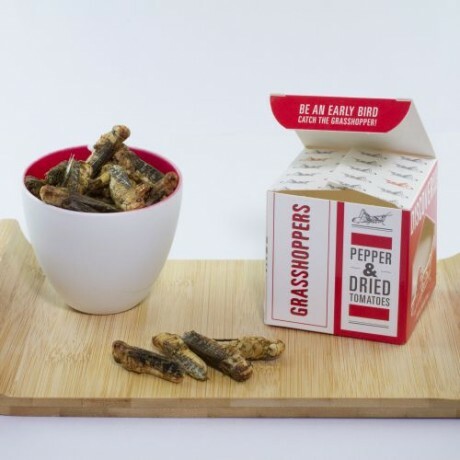 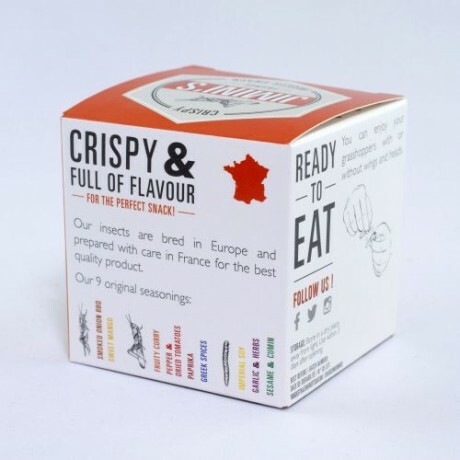 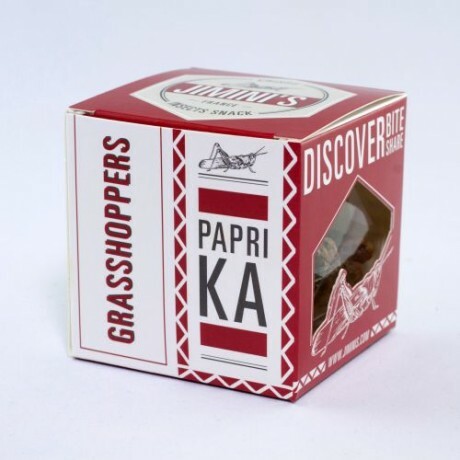 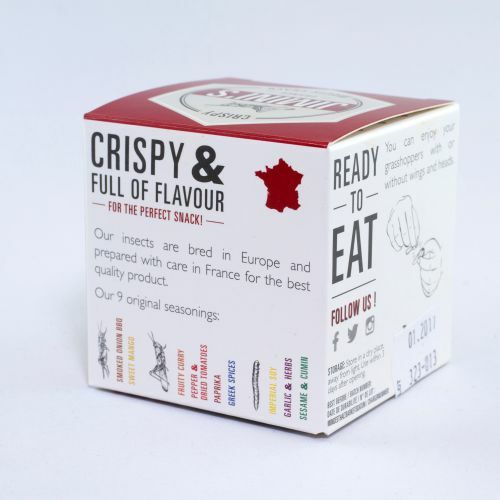 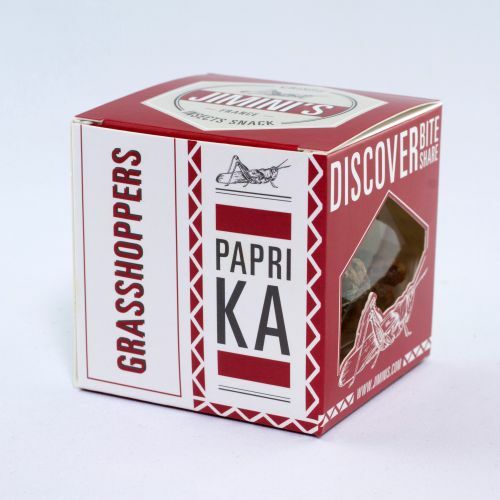 Jimini's grasshopers are farmed in Europe and cooked in France with natural seasonings. Available to buy as 4 boxes (10g each). 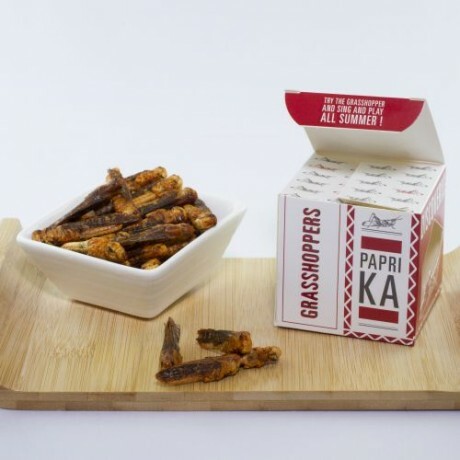 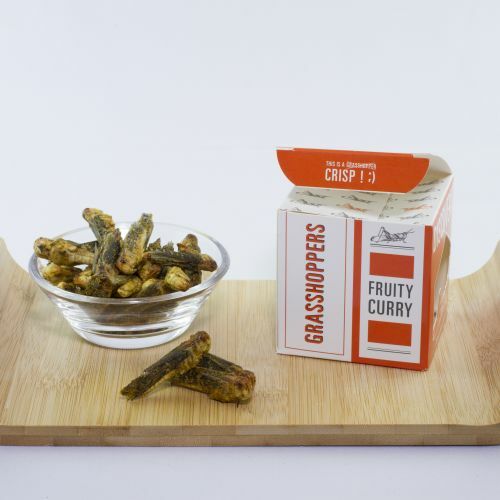 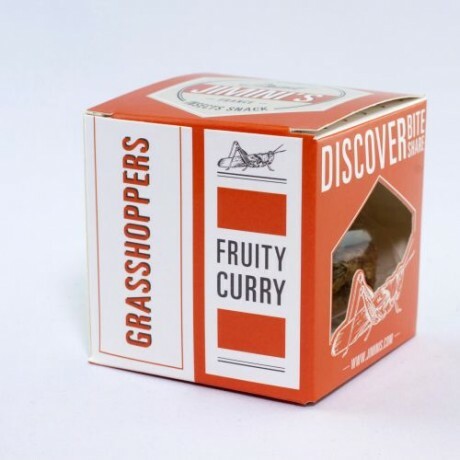 GRASSHOPPERS FRUITY CURRY: Whole dehydrated grasshoppers (locusta migratoria), stabiliser (acacia gum), dextrose, curry (e.a. coriander, turmeric, fenugreek, ginger, chilli), spices (e.a. 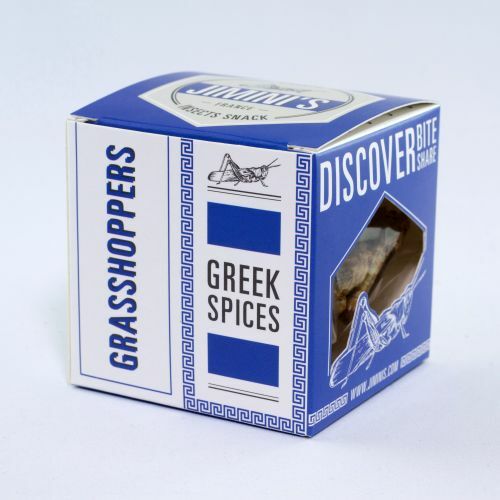 turmeric, pepper), pineapple juice in powder, spice extracts, salt./GRASSHOPPERS GREEK SPICES:Whole grasshoppers dehydrated (locusta migratoria), stabiliser (acacia gum), iodised salt (salt, potassium jodate) aromatic plants (thyme, oregano), spices (pepper, paprika), dextrose, acidifying: E330 citric acid, garlic, onions, natural flavour./GRASSHOPPERS PAPRIKA: Whole grasshoppers dehydrated (locusta migratoria), stabiliser (acacia gum), water, vegetable oil (rapeseed), tomato concentrate, salt, spices (e.a. 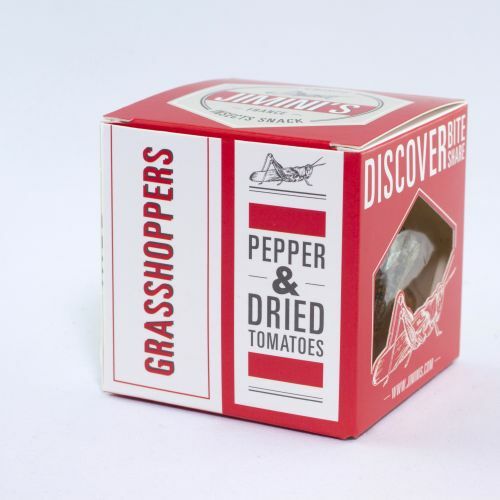 pepper), flavour, sugar, aromatic plants./GRASSHOPPERS PEPPER & DRIED TOMATOES:Whole dehydrated grasshoppers (Locusta Migratoria), stabiliser (acacia gum), salt, tomatoes, aromatic plants, spices (e.a. 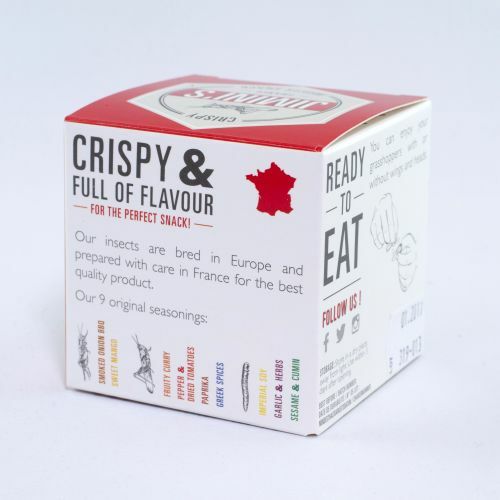 MUSTARD flour, pepper), SESAME, hydrogenated vegetable fat (palm), peppers, dextrose, onions, garlic.